Anti-Circe: Anti-Circe Calvet (the default type): After a capture the capturing piece (Ks included) must immediately be removed to its game array square (necessarily vacant, else the capture is illegal). Captures on the rebirth square are allowed. Game array squares are determined as in Circe. An interesting problem of Franz! But I think that the “distant wSb8” is not a successful blocking piece here. Better and, paradoxically, would be blocked by the white king. Some small modifications of this version are possible, of course. Right, the blockmoves with the white King are better and paradoxically. 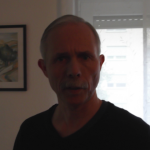 Petko, do you agree, when I changed my problem with your version and you will be Co-Author? Just a small note for Julia: the Camel and the Zebra have the same symbol on the diagram, one of them ought to be changed. Thanks, Kjell! Zebra is corrected on the diagram! Ingenious use of Anticirce condition to take the mating piece to the mating square and blocking it in advance with black & white pieces. Petko finds the nice twist that the white King is a much better blocking piece! That is the touch of the master! A beautiful problem, but I have a strong feeling (it is only a feeling yet) that the twin is not justified. The intention is, of course, to also keep the use of WK as an obstruction, as proposed by Petko. Maybe, another pair of fairy pieces (instead of CA/Z) is to be used. Something like this is possible. Twin can be interesting when the change is small (like in this case a pawn move on the file) and if the answer to the question “why the solution is not the same” is subtle. Unless twinning is the part of author’s idea and not a technical device to make problem correct, it should be avoided if possible. Of course, everyone is entitled to his opinion and assessment. In this aspect any opinion deserves interest – in one way or another, it is useful for authors, even as information with which they did not agree. Such comments are also very helpful for readers. The positive effects are the themes for discussions! Further, I present my counterarguments only as a co-author, Franz probably would have said something different !? I think that aesthetically the Evseev`s version is very far from the original –No.763.1 Franz Pachl &Petko A. Petkov. 1. It is evident that use of the figure nFS here is quite formal and artificial. Two thematic pieces here nZa5 and nFSd4 are from the different fairy-families, and it is not good. First – about one of the main questions: why here it is better to work with another pair of figures, although this is possible? What is the purpose? 2.The white pawn is captured twice on the field c2 and it is also unaesthetic. On the contrary – in No.763.1 the w.P is captured in both phases on different squares – e4/e5 and this should be considered as a plus, not as a minus of the problem! Very easy is to compose a similar problem with two captures of a white pawn on the same field! 3.Between the two solutions there is no complete thematic identity – pay attention that in the solution 1.Rd1+ Kd7 2.Znxc2(Znc1) Znf3 3.Re6 Snxf3(Snf8)‡ the white King opens line by the Rb6 but there is no such element in other solution! 6. In my opinion, a complete misconception is that a problem with two solutions is better than almost the same composition , but created with twins. In general this is true, but in many specific situations the choice of twins is better. Twins, or two solutions? The answer depends to a large extent on the level of economy of material in both versions. To start with, I absolutely agree that my version is not as good as original. It was created somewhat hastily – mainly to demonstrate that it is possible to avoid twins. (When I propose something on this forum, I always try to show that my proposal may be implemented, but not always have time or will to ensure desired quality). I would not object on every item in your post (even though I have different opinion on some of them), but hopefully will be able to produce a new version with another way to avoid twinning. The following version (with minimal changes to original problem is possible). Thanks for your efforts and for the new version. But according to my aesthetic principles, this version is unacceptable. The reasons for this are many. Of course it is a collective work – I still do not know the opinion of Franz. Therefore, I express my subjective opinion. Firstly here we have a lot of undesirable technical black figures. In my opinion – the black Zf1 is a heavy technical compromise – this piece is completely superfluous in the set-play (after 1. Rc1) . In the real play Zf1 plays only as a cook-stopper! Even just on that ground I would never posted such a problem! A fairy piece as a cook-stopper? This is a common occurrence mainly in many so-called direct “Alphabetic problems” (In my personal opinion – vicious and unaesthetic!) but in H# genre I can not accept a similar method as a normal in any case! Not good is also the bSa8 – such a S is not needed in our collective problem! .Very questionable is also the role of the black CAg6 – an other technical piece which leads to another – thematic minus – in the solution 1…e5 2.Rd1 Kd7 3.Znxe5(Zne1) Zng4 4.Sf5 CAnxg4(CAng8)# it is obviously that the move 2.Rd1 blocks two pieces – nCAg8 and b.CAg6. Such “double block” doesn’t exist in the set-play…. 1. Concerning Zf1. I agree that this is a heavy price – but I have found that fortunately it is possible to remove Zf1 and Ph4 replacing them with a single nPg3. This is also kind of compromise, but, I think, much more acceptable, especially in a setplay problem. 2. With Sa8 the question is much less obvious. In 763.1 two pawns – c4 and d4 – are only needed because a8 is free. There is no unequivocal answer if a technical piece is better or worse than several technical pawns. In my version Sa8 controls square c7 at the same time allowing to keep c-file open. While square d4 has to be occupied anyway in h#3.5, Sa8 allows to remove pawn c4. 3. I have absolutely opposite opinion about CAg6. I t is not a thematic minus, but a thematic plus! The moves Rc1 and Rd1 in this version have two anticirce preventive effects: one immediate (disabling attacks to c6 and d7 from CAf7 and CAg6) and one delayed (disabling similar attacks by neutral piece on mating move). 4. Also, it is possible to remove Pb6 if condition Anticirce Cheylan (default to WinChloe) is used. In this case only the same 14 pieces as in original 763 are required. Thanks for your answer and for your new idea! Unfortunately, I do not think that your new version is a step forward in your efforts to avoid – at any cost the twins. Incidentally, I believe that these efforts are quite strange, because they are associated with a lot compromises in constructive and thematic respect. But I am now in a “zeitnot ” and I have no time to write in detail. I will do that tomorrow.